Quantity of seats, including driver's, and carrying capacity for GAZ-69 (69A): 8 persons or 2 persons and 500 kg of load (5 persons and 50 kg of load). Dimensions (appr., in mm): overall length - 3850; overall width for GAZ-69A and GAZ-69 without spare wheel - 1750; width for GAZ-69 with spare wheel installed - 1850; overall hight GAZ-69 (69A) - 2030 (1920); wheelbase - 2300; front and rear track - 1440. 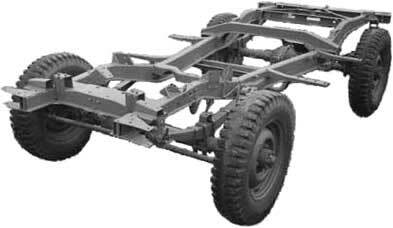 Minimum ground clearance under: front axle - 210/8; rear axle - 210/8; transfer case mounting crossmember - 310/12. Overhang agles: front - 45°; rear - 35°. Minimum turning radius - 6 m.
Maximum speed - 90 kmph. Ascent angle: without trailer - 30°; with a trailer up to 850 kg of wieght - 20°. 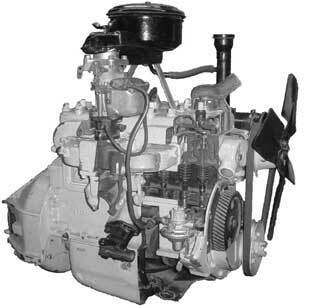 Engine type - 4-cycle, gasoline, carburated induction. Number of cylinders - 4. Peak horsepower - 55 л. с. at 3600 rpm. Peak torque - 12,7 kg-m. Clutch type - dry, single disk. Ratios: first - 3,115; second - 1,772; third - 1,000; reverse - 3,738. Transfer case - gear drive, divorced, part-time, two-speed. Ratios: 1,15 and 2,78. Three driveshafts: inermediate, front and rear. Axles gear ratio - 5,125. Axleshafts type - full float. Wheel alignment angles: camber - 1°30'; steering axis inclination - 5°; caster - 3°; toe-in - 1,5 - 3 mm. Suspension - four longitudinal half-elliptic leaf springs with hydraulic piston lever-type shock absorbers. Low pressure tires of the size 6,50-16". Steering: globoidal worm shaft with double roller gear; average ratio - 18,2:1. Brakes: drum type on all the four wheels, hydraulic. Manual parking brakes - drum type, mounted to the rear of transfer case; cable operated by the lever. GAZ-69 body - soft-top, eight-seates, two-door with rear tailgate. GAZ-69 body - soft-top, five-seates, four-door with rear trunk. Spare wheel location: GAZ-69 - on the left side of the vehicle; GAZ-69A - in the trunk.